One of the most exciting parts of planning anything is watching it begin to come to life. During Creative Writing today, we began discussing details of what we want our fall show to look like. Although we are still in preliminary (and top secret) planning stages, the show already feels real and immediate. To help us begin working on the show itself, we had two artists, Tony and Rachel, come in. One of the nice things about enlisting outside help is you get the benefit of their ideas and opinions. Having Tony and Rachel in helped us make our plans more detailed and organized. It’s crazy how much can happen in a class period; at the beginning of the day, we hadn’t even decided on a theme and now our show is already taking shape! One of my favorite parts of the day was when we each said one thing we could bring to the show that was specific to us; the list included knife throwing and onstage cooking, so it’ll definitely be exciting. Today was both productive and enjoyable and I can’t wait to keep planning our show and seeing the new directions it takes! It’s no secret these days that it’s rapidly turning into autumn. It rained this saturday, I can’t wear just a tank top and a sportscoat at night anymore, and, perhaps most importantly, the Fall CW show is just around the corner. Today in Creative Writing we spent most of the period listening to theme ideas from Tony and Rachel and Carol (the person who gave birth to me, for anyone who didn’t know), our artistic directors. 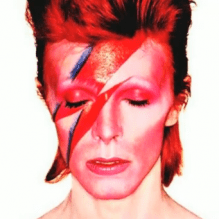 They took us through the various stages of David Bowie’s work as an example of an artist who has both gone through a very complete journey, and as an artist who works within in many different personas and genres. We then got to propose our own ideas for the show, which, like many matters of national security, will remain secret until it comes out of our proverbial oven, so to speak (to give a little food analogy retort to Midori who assumes I just never read the blog and so seeks to slander me with being an unpatriotic CW student).